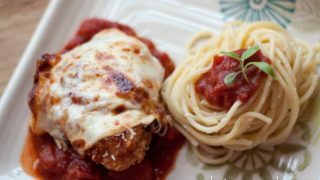 Chicken Parmigiana might take a little longer to throw together than some of my other dinner on the site, but trust me. It is worth it. Homemade breaded chicken with a quick, but intensely flavorful marinara pair perfectly with a high-quality Reggiano to make one of my favorite meals of all time. 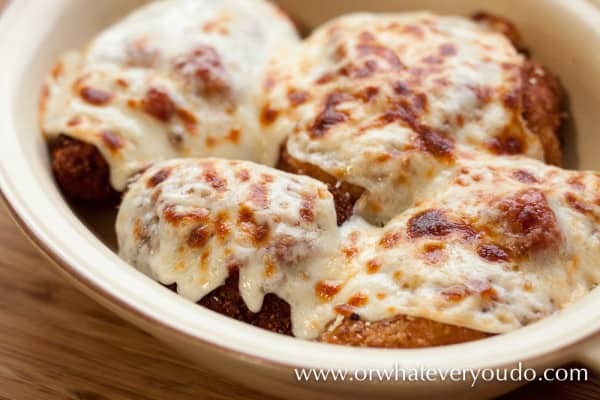 I was so excited to share this chicken parmigiana recipe with you all that I had to get up and post it right this second, the morning after I made it. This usually NEVER happens. Also, since I have had a slacker blogger kind of week or two, I figured I owed you a good one. I have always been such a spaghetti with meat sauce fan, I have never really bothered much with any kind of red sauce + chicken variations. If I want chicken with pasta I usually will make an alfredo or wine and mushroom sauce and call it good. I was wanting something a little different, so went searching and searching the internet for ideas. 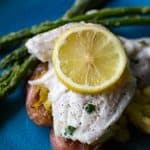 I know chicken parmigiana is nothing unique, and my recipe is probably pretty similar to most of them out there, but I really liked it. Since it is new to me, maybe it will be new to some of you too! First we are going to get our simple marinara sauce started. 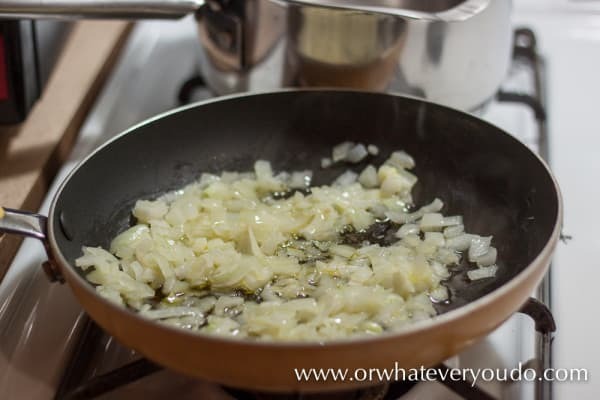 Place your olive oil and onion into a saute pan, and slowly saute until the onions are translucent. Add your garlic and saute an additional minute, and then add the whole bunch to your sauce pan, along with all the other sauce ingredients. Also, if you have it, toss in your rind from your reggiano in there. 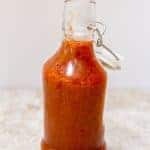 It does amazing things to sauces and soups. Trust me. 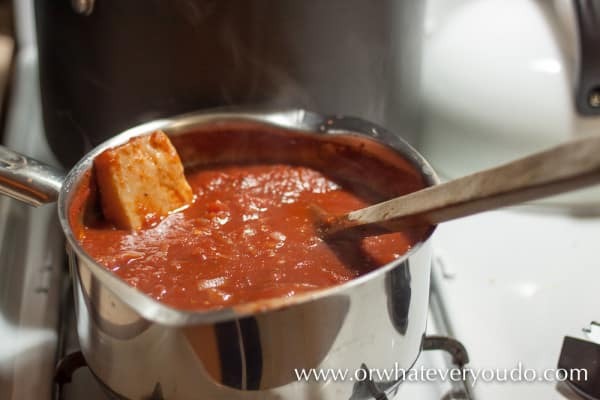 Let the sauce simmer, stirring occasionally, while you cook your chicken. 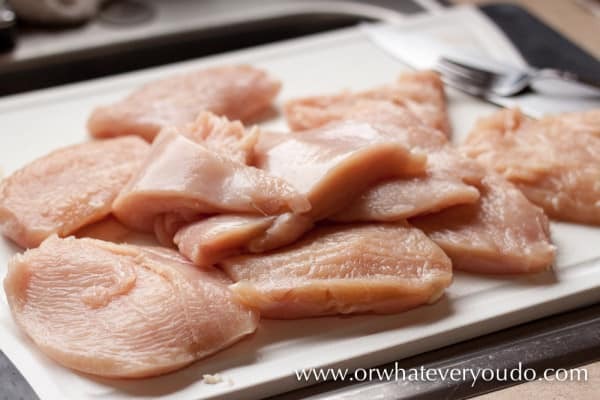 Start your chicken by trimming and slicing up 3 large chicken breasts. I cut them in half, then I cut the thick half in half again the long way. The smaller chunks that needed a little trimming down I pounded a bit flatter so they would cook evenly. Next get your breading set up. You can also get your oil on the stove preheating if you’d like. 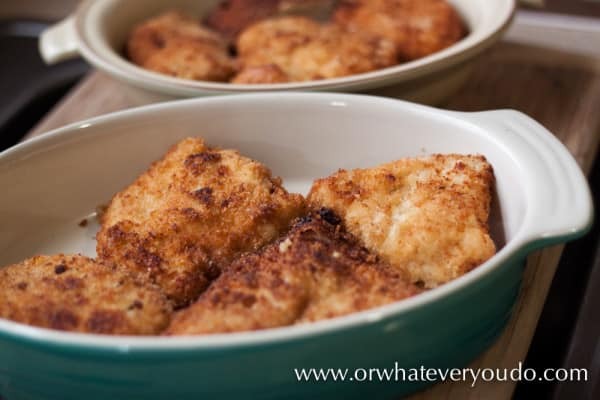 Bread your chicken (and anything else you are breading, this is a great method as well!) by dipping in flour, then in the buttermilk/egg wash, and then into the panko/crumb mixture. Set aside until they are all well coated. Now get to frying! Heat your oil over medium heat. Test the temperature with one of your smaller breasts first. It should bubble right when you put the chicken in, and take about 2-3 minutes per side, maximum, to brown. Adjust your heat accordingly. Don’t worry about the chicken being cooked through at this point. 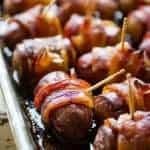 You really just want it browned well and crispy. It will finish cooking in the oven. 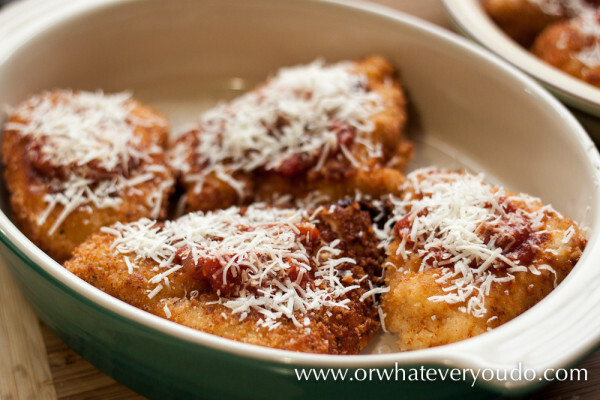 Place your chicken parmigiana patties in an oven safe dish (or dishes, in my case! I cook for an army AND for leftovers). 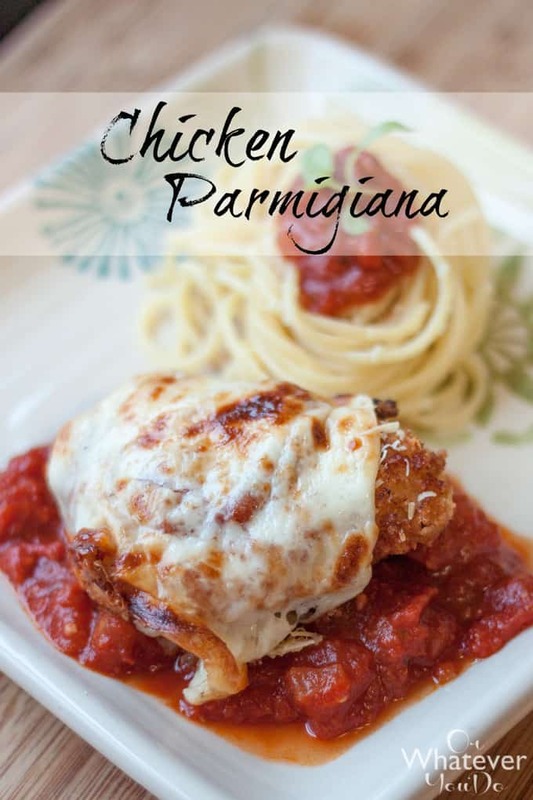 Top the chicken with a spoonful of sauce and a generous amount of parmigiano reggiano. Next top with an even more generous amount of mozzarella cheese sliced thick! Bake at 375 for 15-20 minutes, or until the cheese is melty and the chicken is fully cooked. Place under your broiler for the last 2 minutes to lightly brown the top of the cheese. Just as an aside, I had no idea until last month that in a lot of gas ovens, the broiler is in the drawer under the oven??? How did I go through 31 years of life, many of those adult years WITH a gas oven, and not know this? As another aside, I do not suggest trying to use said oven drawer broiler at 6+ months pregnant. Hilarity will result trying to get low enough to SEE the food, while not being able to actually lay on your stomach. Serve your chicken parmigiana with a generous portion of pasta. I tossed mine in extra virgin olive oil, a handful of reggiano, and a sprinkle of salt. Then a spoonful of sauce on the noodles, and a couple spoonfuls under the chicken. It was awesome. ALL of my kids even ate it after the initial, “What is this OH MY GOSH I HAVE NEVER SEEN THIS BEFORE GET IT AWAY FROM ME!!!! !” from the resident picky 3 year old. 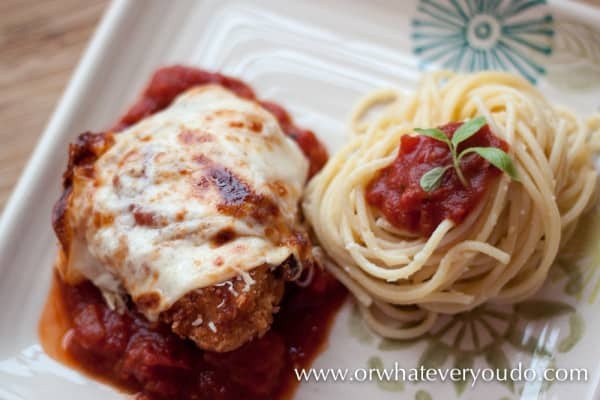 This homemade chicken parmesan is simple to make and is a family favorite here. The sauce is fresh and bright and the chicken is crunchy with a panko breading that is out of this world. Saute onions in olive oil over medium low heat until translucent. Add garlic and cook an additional 1-2 minutes. Place onions, garlic, and olive oil into a sauce pan, and add the wine, diced and crushed tomatoes, reggiano rind, basil, and oregano. Heat to a simmer, stirring frequently. Add salt to taste. 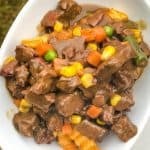 Continue simmering while you cook the chicken, stirring occasionally. Heat 1 inch of oil over medium to medium high heat, and preheat your oven to 375. Trim all visible fat from chicken breasts and cut in half. Pound or slice breasts to equal thickness, about 1 inch thick. 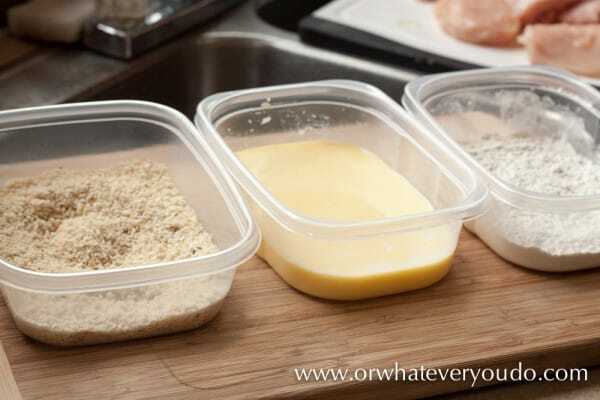 Mix flour, salt, garlic powder, onion powder, and black pepper in one container. Whisk together buttermilk and eggs in another container. Mix together panko and Italian bread crumbs in another. 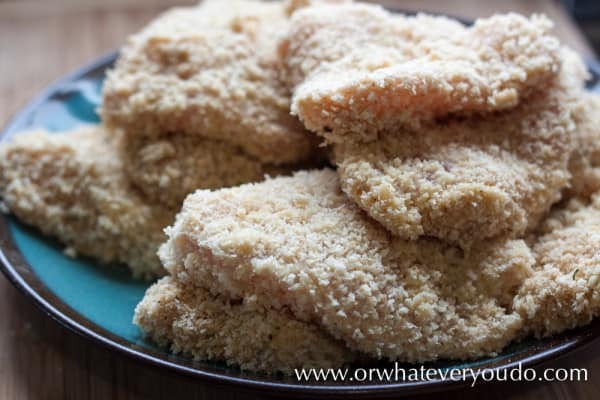 Bread chicken by dusting with flour mixture, then fully coating in buttermilk mixture, and the coating well in the panko mixture. Set aside and repeat until all chicken is breaded. 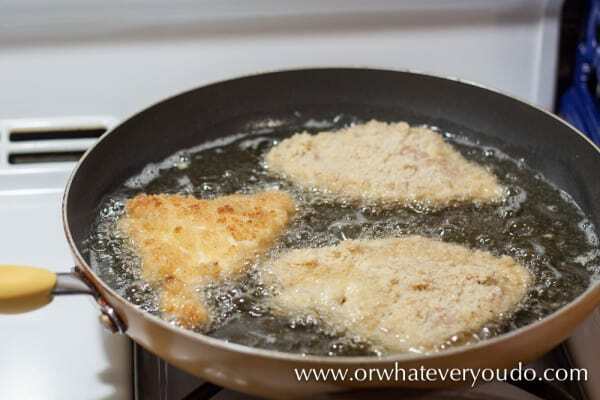 Place the smallest piece of breaded chicken into the oil to test the temperature. 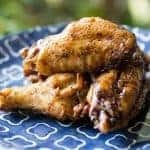 Oil should bubble around the chicken immediately, and chicken should take between 2-3 minutes per side to brown nicely. 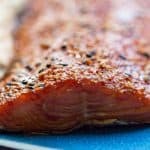 Remove from the oil onto a paper towel lined plate. 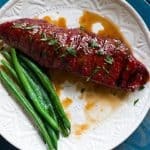 Don't worry about the chicken being entirely cooked through, as it will finish cooking in the oven. Boil noodles until al dente, and then drain and toss with a drizzle of olive oil, a generous handful of reggiano, and a few shakes of salt. 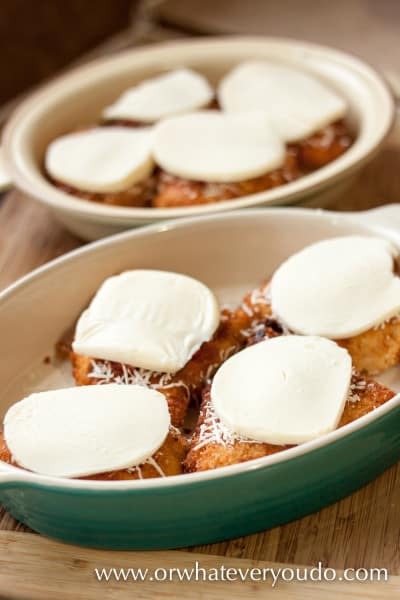 Place the browned chicken into an oven safe dish, top with a few tablespoons of sauce, sprinkle with a generous amount of parmigiano reggiano, and then top with a thick slice of mozzarella. Bake for 15-20 minutes, and then finish under the broiler until the cheese is bubbly and lightly browned. Serve with pasta immediately. 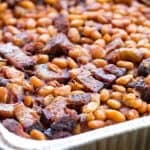 This was great, even my husband liked it. Yay! I'm so glad you guys enjoyed it!